Finally I’ve managed to find the time to write about my cousin’s wedding Alex and I attended in Poland back in September 2008. 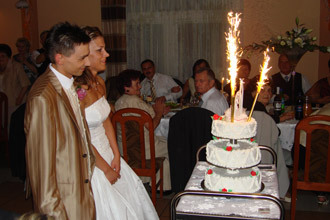 Typical Polish weddings start on a Saturday and take 2 days! In a few words, it’s all about tradition, church, drinking, eating, dancing, drinking, singing, drinking etc. I’m familiar with all of that (maybe with some exceptions), but for Alex it was all new. And for both of us it was a truly unique experience. Also as it was my closest cousin’s wedding, Alex had a chance to meet my whole family for the first time. It took place in Kolo (pronounced kowo), a small town in central Poland, where I was born. Friends, neighbours, anyone can build a “gate”, which could be on the new married couple’s way from home, from church to the car, to the party, anywhere. To cross such gate they have to pay, most often using a bottle of vodka as currency (or sweets for kids). Once they get free, they are leading the way to the party, and all the cars following them continuously beep their horns! Here the party comes. Guests have to be there before the new married couple. When they finally come they are welcomed by the parents with bread and salt. Everyone gets a glass of champagne to drink; the bride with the groom breaks their glasses. Then the groom is carrying her on his arms (if he is able to) to the party room, where they will open the first dance (how stressful: 60-250 people are watching them!). The party (1st day) usually continues until early morning (you can leave earlier, if you can’t stay so long ;)). There is lots of food, and actually you are expected to eat all the time. There is various food, including intestines (at least on this wedding). There is even more to drink and the main choice is between vodka and… vodka! There are breaks between eating (and drinking) and you are expected to go to another room, a dancing one and dance! There is waiting for you a great local band singing “Ken Lee” or any other English hits without actually using English words. The good thing is, they have great hits for grandmas, kids and others, but believe me, the more vodka you have, the more you love it. I completely forgot how to drink vodka at weddings… You basically should cheat! You are only drinking half shots or pretending you are drinking one. Because I didn’t share that golden rule with Alex… you can imagine we didn’t stay sober for long. But we still enjoyed “ocepiny” which took place at midnight, which is one of the oldest and the most important of Polish wedding customs. In old days, it was so significant that only after ocepiny, and not the church ceremony, was the bride considered to be a married woman. Before ocepiny, the bride socializes and dances with her unmarried female friends. After ocepiny, she belongs to the married women’s circle. The bride and so groom are placed on the dance floor, facing the guests. The band (or in some uncontrolled cases a family member) is singing all the funny/dirty songs about losing freedom and virginity, losing children by their parents, etc. All of the unmarried girls stand behind the bride. Next, bridesmaid removes the bride’s veil. Finally, the bride casts the veil behind her, and the girl who catches the veil is the next to marry. Similar thing happens to the groom’s tie, which one of unmarried guys has to catch. Then the new pair has to dance together or do something else together. Also, still as a part of “ocepiny” there are loads of games and dancing. The price for a winner of each competition is a bottle of vodka. So there is “clothes exchange”, some chair dancing, some more jumping and crazy stuff. One of the competitions was dancing and Alex, as a special guest (almost nobody was able to have a conversation with him, before drinking) was asked to join them. That was a dancing competition for couples, where only guys were dancing… Alex was a woman. Imagine a traditional Polish family, where everyone is serious and polite. And now imagine Alex (not really sober), going slowly and politely at the beginning, the same as the rest, and then going wilder and wilder!! Alex and his partner looking like a dirty couple on that dance floor!! I have never ever seen my family happy like that, laughing like crazy, everyone was crying! They obviously deserved those bottles of vodka more than anyone else. And yes, my family absolutely loved Alex from that moment on! So you’re waking up on Sunday morning, feeling great or very opposite, and have a few hours to get ready (sometimes to squeeze church in there as well). How does the Groom wait 2 whole days from the start of the wedding till bedtime? Sounds like a great do for family and friends but if it was me I would be tearing my hair out……. ha, that was good wedding! I really love polish wedding traditions!